Waiting on Wednesday is a weekly meme hosted by Jill at Breaking the Spine that spotlights upcoming releases for books we can't wait to read. 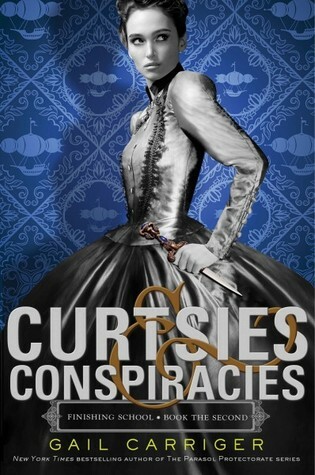 My pick is Curtsies & Conspiracies by Gail Carriger! I'm so excited for this! November can't come fast enough. I just read the first book in this series, Etiquette & Espionage, this past week. It was so charming and funny, and I love the steampunk feel to this series. Also, is it me or do these books have some of the absolute best titles/covers ever? I'm obsessed with these gorgeous covers, and I think the titles are so clever. I haven't read any of Gail's other books, though I have seen the first book in this series make it's way around the blogosphere! The titles are really cool! The covers... not doing much for me. But that's okay! Nice cover and the steampunk element sounds cool too. Steampunk + spy school= win! This sounds fantastic! I love The Gallagher Girls series, and this sounds like it'd be similar. Awesome cover too. Love those blues.